Use to connect two dry contact sensors to the E-1W 1-wire daisy-chain configuration. Each E-DI2-1W counts as two single reading sensors. 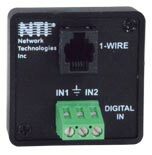 Up to 12 E-DI2-1W can be connected to the E-1W. For dry contact sensors: 3-pin terminal block. Maximum cable length: 600 ft (183 m). Distance between dry contact sensors and E-DI2-1W does not count toward the 600ft 1-wire daisy-chain limitation.